Most people use drones to take magnificent aerial videos and photos. I mean, that’s what drones are for, right? But, this video shows us that it doesn’t necessarily have to be the case. Here you will see a video of a couple filmed with a drone, but in quite an unconventional way – without flying it. When you fly by airplane, bringing the camera with you is a must. How else would you capture magnificent aerial scenes on such height? But would you ever say you could lose a camera through an airplane window? I thought it was impossible, but then I saw this video. It’s only a bit heartbreaking, but most of all – it’s pretty hilarious. 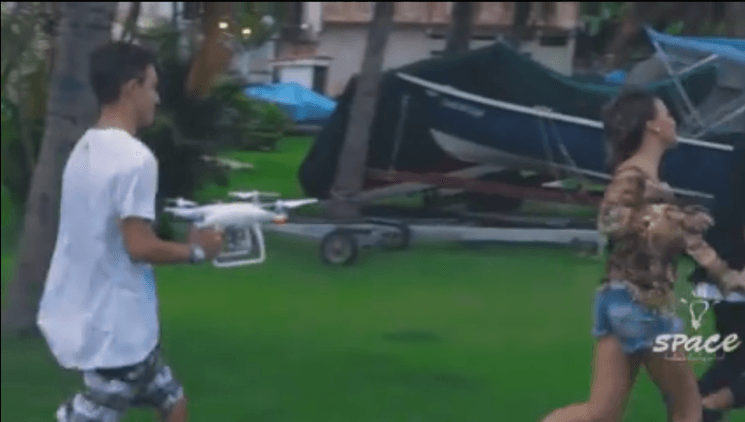 Drones have become the go-to method for getting you GoPro up in the air. But in more and more locations, new regulations limit where we can fly. But what other options do we have? Well, you could gaffer tape it to a coat hanger and swing it around your head on a piece of string. Or, you could stuff it into the front of a giant Nerf football and just throw it. The latter is the option taken by Aer co-founder Mark de Boer and his friends. Sort of. It’s not an actual Nerf football, but the design of the Aer is very similar in appearance. You will notice, though, that this has much larger fins. These should help to keep it level and not spin wildly through the air as it travels, making for cleaner, steadier footage. In my review of the Seaport Digital MegaMast, I mentioned a few projects that I was just dying to try…well this was one of them. Stick $4k worth of camera gear up on a three story high pole and shoot fireworks at it. Ya – simply because I though it would be amazing…and because amazing sells.